While the Summer offers us dry-skinned folk a bit of a break, we still need to get a little hydration every now and then. The thing is, the last thing anyone wants on a hot, humid, oh-my-god-I-think-I'm-melting, day is a slathering of a heavy, thick moisturizer. It's just not comfortable. 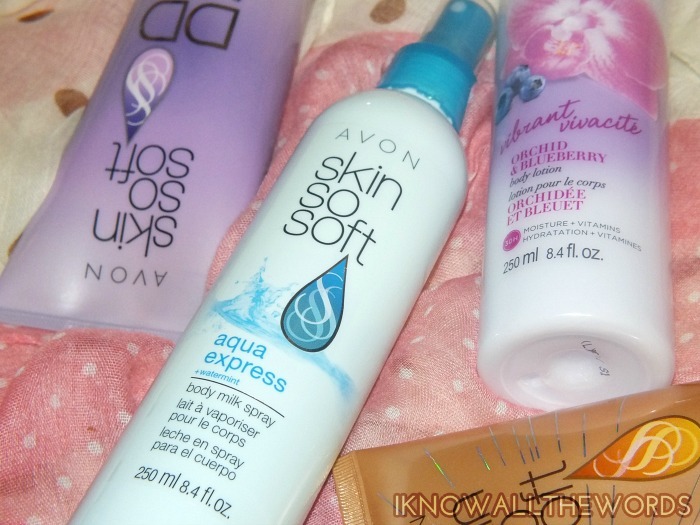 It just so happens that a few of Avon's newest body care options are not only moisturizing, but also light weight and totally Summer appropriate. Read on! I'm going to start with my favourite because... Well, because I can. 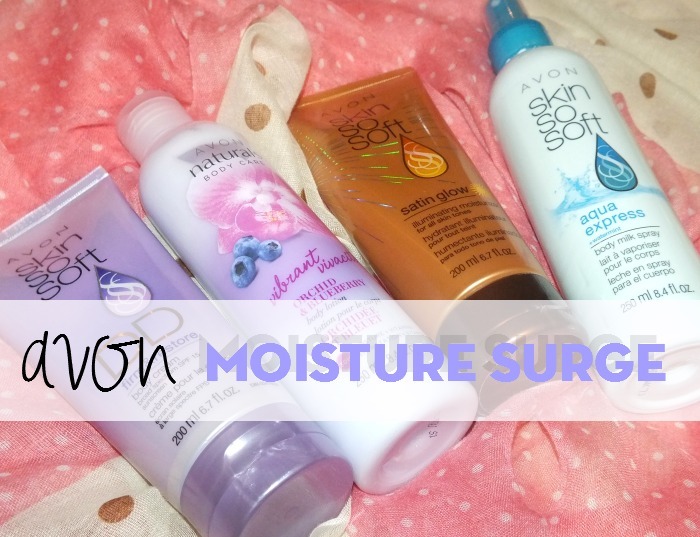 Avon Skin So Soft Aqua Express + Watermint Body Milk is an interesting product, as it's a thin, fluid moisturizer, formulated with watermint oil,shea butter, and Vitamin E, that's sprayed on. It kind of sprays in a blob, so it still needs to be rubbed in, but the texture is light and absorbs quickly and cleanly. There isn't the slightest bit of residue or heaviness but skin is instantly hydrated and refreshed. Love it! Oh, and it has a light, watery-citrus scent that is quite nice. 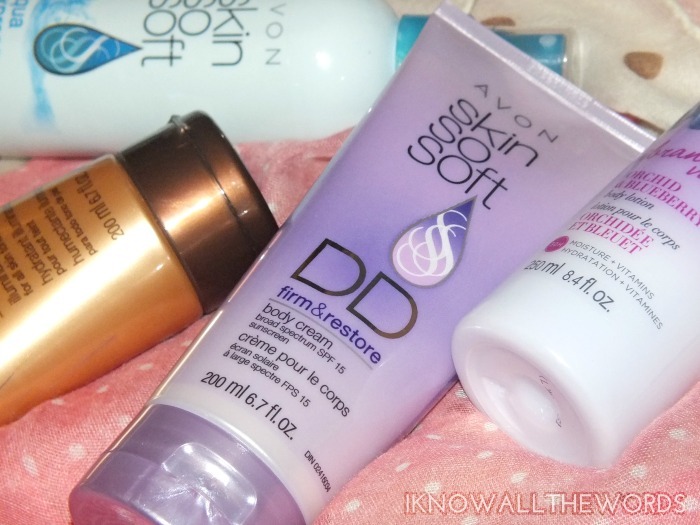 While I'm not entirely certain what the DD stands for- I'm thinking Daily Defense- Avon Skin So Soft DD Firm & Restore Body Cream is a great way to get your SPF and moisturizer in one. While SPF 15 isn't all that high, it's something, and a nice backup if you happen to forget apply something higher later in the day. Avon claims this is a 9-in-1 formula, that can firm, even skin tone, boost elasticity, moisturize for 24 hours, do your laundry, smooth skin and more. While I can't say if it did much to even skin tone or many of the other claims, but it does moisturize quite well. It absorbs quickly and completely- I even reach for this for use as hand cream because it leaves absolutely no residue on skin- and has a really nice, barely floral scent. There does have a little bit of shimmer in it that is noticeable when you apply it, but as you massage it in it becomes almost invisible. 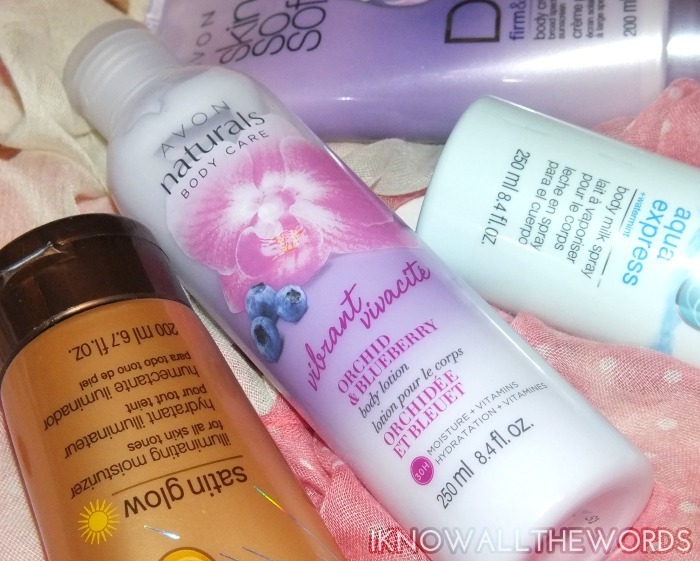 For those who are all about the scent factor, Avon Naturals Vibrant Orchid & Blueberry Body Lotion is an excellent pick. Vibrant Orchid & Blueberry is the newest scent to the always expanding Naturals line and is a fresh blend of sweet blueberries and light orchid notes with a touch of pink grapefruit for a little kick. The scent is light, but really fresh and happy- plus, if you really can't get enough there is a matching shower gel and body spray. The moisturizer is light feeling and leaves skin nicely hydrated, but does take a moment longer to absorb than the others I've mentioned so far. And, last but not least, one for those who want a little glow. 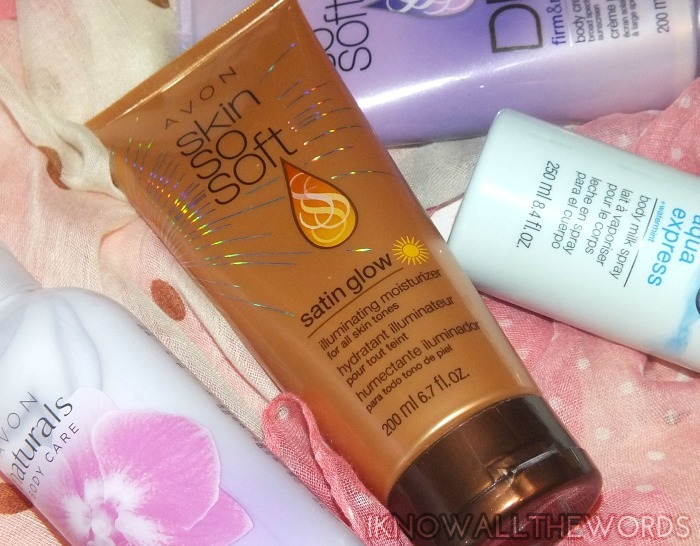 Avon Skin So Soft Satin Glow Illuminating Moisturizer is first and foremost a moisturizer, but it's lightly tinted to give skin a kiss of a bronzey glow. The tint is very sheer- it will work on even the palest of the pale- but gives skin just a bit of a boost along with very minimal golden 'optical illuminizers' that diffuse light and give skin some extra radiance. The scent is quite nice, I can't quite pin point exactly what it is- Avon says it's zesty orange flower and tropical coconut. Whatever it is, I like it. Hydration wise, it's on the lighter side, but it absorbs quickly and leaves skin smooth with no heavy feel. Overall, you can't go wrong with any of these moisturizers. My favourites are the Aqua Express Body Milk because it's just so fast to apply and Satin Glow as my never tanned pale self benefits from the little bit of glow it gives. What's your go to Summer moisturizer? Tired any of these?